Delicate flowers, embellished with glistening stones, are linked together to resemble a daisy chain. A unique blend of metals contribute to this rings feminine rose-hue and is great for stacking - wear it with other floral pieces to maximise the botanical effect. Available online or in-store. PANDORA Rose Dazzling Daisy Chain Ring is rated 4.5 out of 5 by 74. Rated 4 out of 5 by arotz from Perfectly Feminine My boyfriend gifted this to me yesterday before I left for a trip. 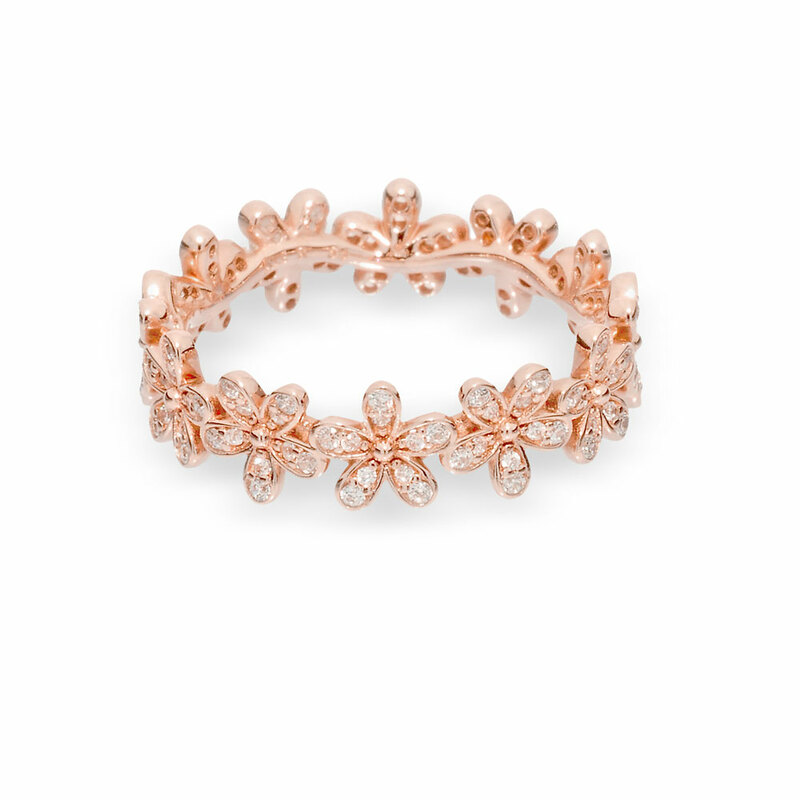 The rose gold is a perfect contrast against the cz flowers. Its easily stackable and also looks great alone. The only downside is because the flowers on the ring have shape, they rub against your skin a little and that feeling takes some getting used to. Other than that, I couldn't be happier! Rated 5 out of 5 by Michele80 from Fabulous Customer Service! I bought this ring for my daughter for Christmas. It's absolutely beautiful and she loved it! However, by February two of the stones had fallen out. I contacted customer service and within 24 hours (!) they had a new ring being sent out to me to replace it. I've never rec'd this kind of fabulous customer service from any other company. I will definitely order again from Pandora! Rated 4 out of 5 by Kat01 from Beautiful I bought this for my daughter, as one of her gradulation gifts. She was thrilled, but unfortunately the smallest available size was still to big for her slender fingers. Rated 2 out of 5 by briana0717 from I really loved this ring... I really love this ring but I have had so many problems with it already. Some of my stones aren’t set properly so they look like there is no diamond inside, every time I get it cleaned it still looks like there is no stones. And now after 1 year and a couple months this happens.. I know I did not pay $100+ just for this to happen. I was happy at first but now I’m just disappointed. Rated 5 out of 5 by yellowDaisies from Dainty and Beautiful! My grandpa passed away two weeks ago and he came to me in a dream with a field of yellow daisies before he passed. I bought this ring in memory of him. Besides the significance of the flower, I love how dainty and girly it makes my hand look. The clear CZ contrasts well against the rose gold! Rated 5 out of 5 by Sscv155st from Exceeded expectations I purchased this ring for my wife's birthday and she loved it but now she wants more so men beware!